There are a couple old investing axioms, first, buy low and sell high, and second, invest early and often. With that understanding I would like to analyze the investing environment for the baby boom and millennial generations. The oldest of the baby boomers, if they chose to go, would have graduated college in 1967 or '68. The oldest of the millennials, of which I am one, would have graduated in 2002 or 2003. If we paid attention to the main stream media we would believe that the biggest financial issue facing millennials is student debt. While there is no doubt that being saddled with a mortgage for what in many cases is a poor product isn't ideal, a little analysis shows student debt shouldn't be the main issue concerning millennials. 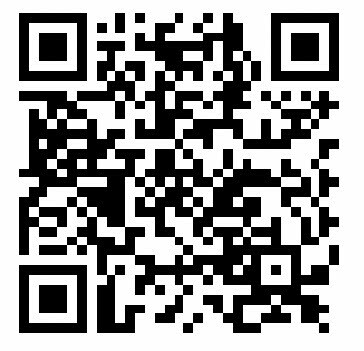 According to ticas.org only about 69% of seniors graduating in 2013 have student debt. Of those with student debt, the average amount was $28,400, which is a fraction of what a millennial should acquire in assets, including a home, 401k, pension, et al, in the first 20 years of their career. In this light, asset prices, which millennials should be acquiring early and often as they say, should be more of a concern than education prices. The following graphs will show that the investment environment is far more hostile for millennials than for baby boomers. I chose to use asset prices to median income for much of this analysis but will touch on mean (average) income later on. In our first chart we show the stock prices to median income ratio. 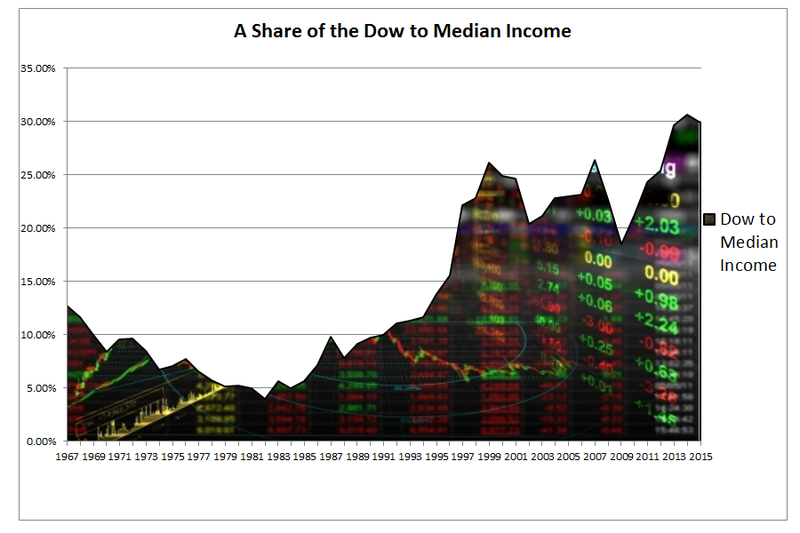 The formula is simply the Dow Jones Industrial Average divided by the national median income and results in what percentage of the median income is required to buy one share of the Dow. This shows the typical baby boomer led family could purchase a share of the Dow for less than 10% of their income. Millennials are not so lucky, they have generally paid north of 20% and are currently paying around 30%. Second, we'll take a look at home prices. 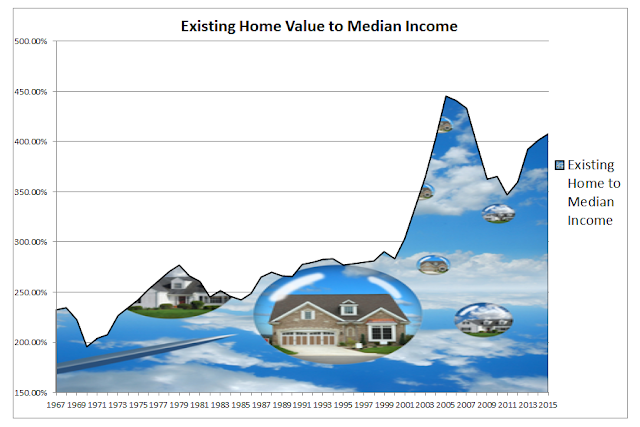 We used existing home value data compared to the median income in the same manner as we did for stocks. This shows real-estate to be nearly twice as expensive as when baby boomers were buying their houses. Where a boomer would have spent two to two and a half times their income on a home, a millennial family now spends north of four times their income. Third we move on to bonds. The benchmark 10 year US treasury was used to represent this asset class. 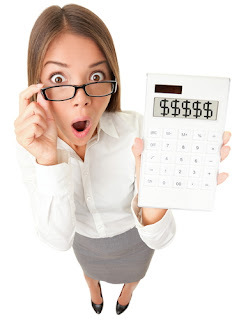 First, I calculated the price of a $1000 10 year bond. Unfortunately dividing the resultant price by the median income is insufficient because of the loss in the dollars purchasing power over the charted time. To adjust for this devaluation I multiplied the price of the $1000 10 year bond by the government's CPI before dividing by the median income. 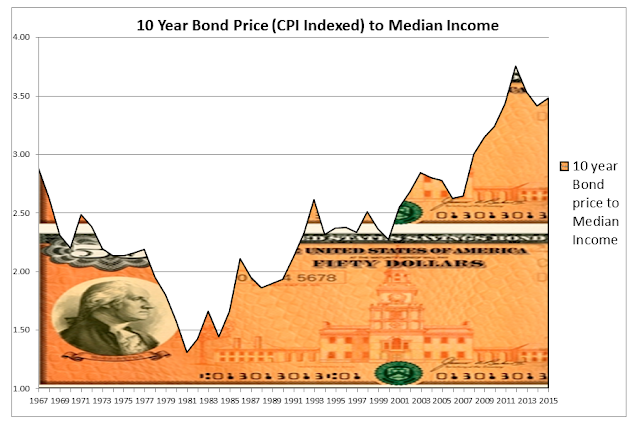 While this still shows bonds to be currently very expensive, and more expensive than at any other point in the time series, if you believe the CPI understates inflation the chart should be even more dramatic. Finally, we move on to gold, and while a much smaller asset class I feel it is important to include. For this chart we simply divide the gold price by the median income. 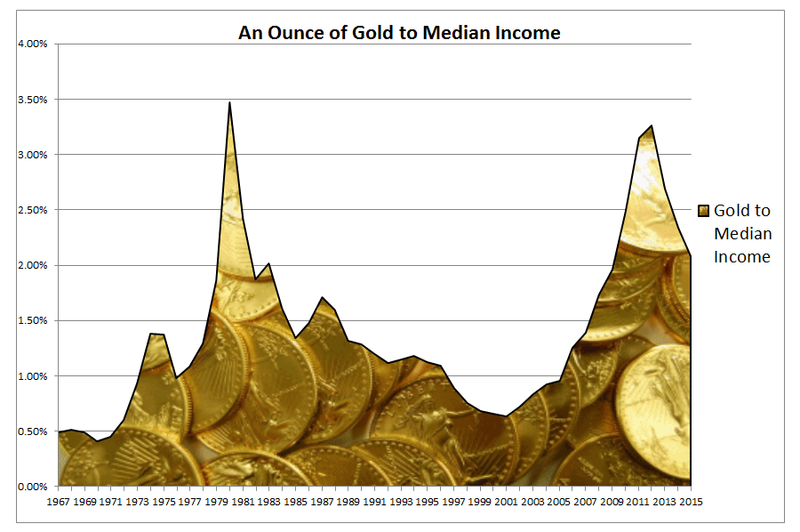 As you can see gold is also richly valued. It may already be clear, but I wanted to combine these asset classes into one simple chart. I gave a 30% weighting to housing, stocks, and bonds and a 10% weighting to gold. 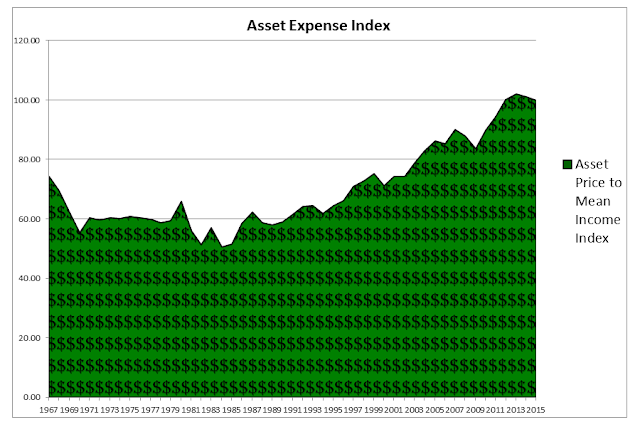 This total asset expense index shows what many have said, all asset classes are now expensive. The above chart represents the price of assets relative to the median family, that is, half the American families have a higher income and half have a lower income. 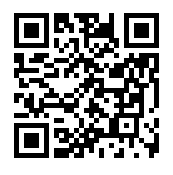 You may be thinking well what about the average income. Not that rising income inequality is a good thing, but it has been rising, and if the mean income were used instead of the median, would this chart tell a different story? Here's your answer. If you want to represent the typical American family with the median, assets are twice as expensive for millennials compared to baby boomers. If you believe average income is a better representation, assets are about 70% more expensive. A little better, but it doesn't change the fact that assets were much cheaper for parents than for their children. Frankly I think the typical median family is a more suitable metric. Now consider that the boomers bought low and are selling high in retirement, and time will tell what the assets purchased by the millennials over the past 12 years will do. 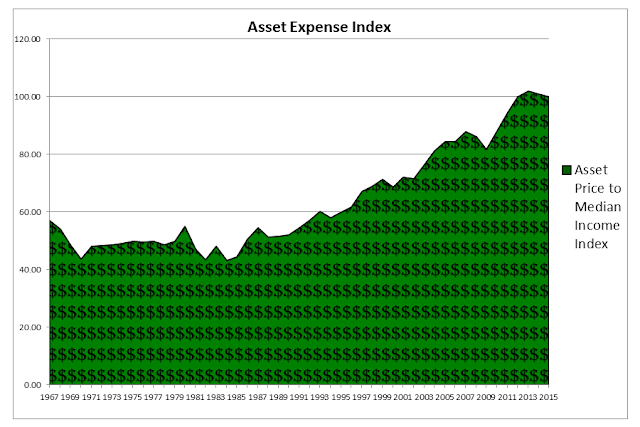 While the above chart only shows an up leg, total assets to income moves in waves. Assets were expensive in the late 20's, cheap from '32 through World War Two, and hit a peak in 1965 just prior to the beginning of this chart. 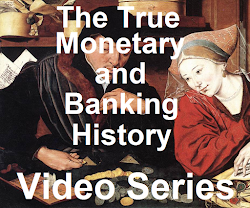 These assets have been manipulated either directly or indirectly through the actions of the Federal Reserve, but we must consider that most manipulations fail, and what the ramifications to asset prices will be if the Fed fails. The next time you hear a boomer tell a millennial to buy as much house as they can, to go all in on stocks, or all the money they have made in the bond market, consider their experience in these markets, and that those trends can reverse. 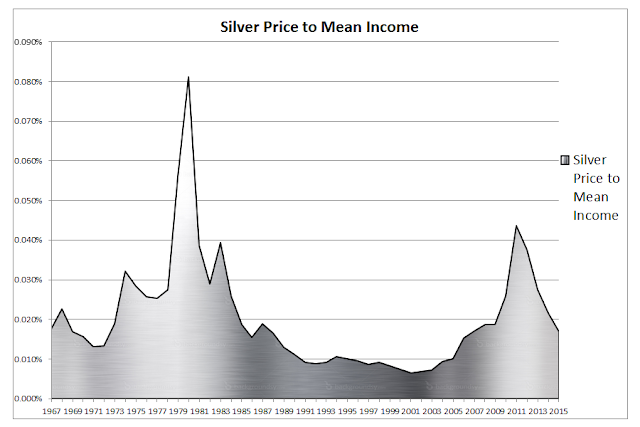 Considering the gold market is measured in the trillions of dollars, and the other markets above are measured in the tens of trillions, it made little sense to include silver in the asset expense index. All of the investible silver in the world is under 20 billion dollars, but comparing the current silver price to median income is informative. 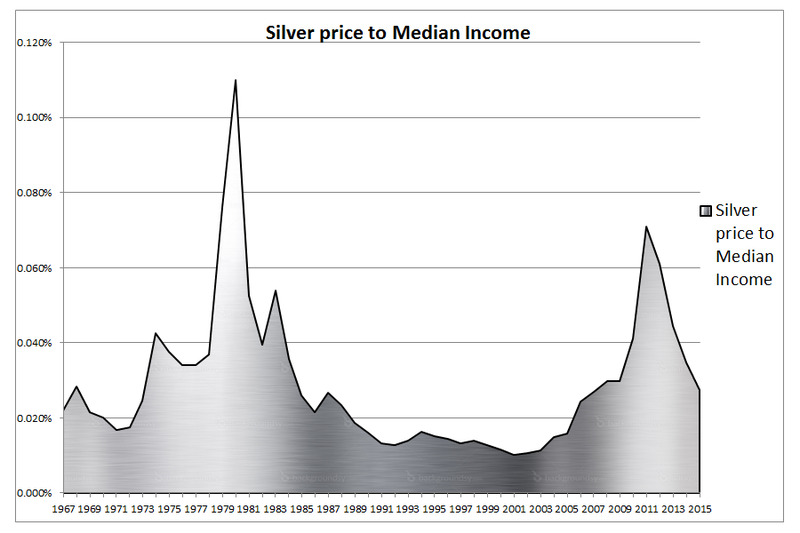 Using this metric silver appears fairly valued. Compared to mean income silver almost looks cheap, obviously not the norm in today's investment environment. Full Disclosure: Barring retirement funds, silver happens to be the only asset I am buying in significant amounts at this time.